In front of a sell-out crowd at Alexandra Palace Trump totally dismantled the former world champion with a clinical display of potting and tactical awareness. The tone of the match was set from the very first frame as O'Sullivan missed a long range blue and a black off it's spot in handing two chances to Trump. The second one being the most costly as Trump rolled in a decsive 39 to clinch the frame. Having wrested the first frame Judd promptly put his foot on the accelerator as he rolled in a 66 in frame two. The Bristolian was on course for a 148 but spurned the chance of a risky black or blue to play safe. It was to pay dividends for Judd as Ronnie missed a long red to the corner and Judd duly put together a 30 to put himself 2-0 up. It was turning into a nightmare of match for Ronnie as he was forced to sit in his chair and watch Judd hammer in a 78 after his safety caught the knuckle of the middle pocket. As if that wasn't bad enough from his point of view there was the hammer blow of Judd banging in a long red from under the baulk cushion - and then setting off on a 140 total clearance. Not only did it put Judd in the lead for the £15,000 high break prize but it was also the the 34th century of his season and the 144th of his professional career. 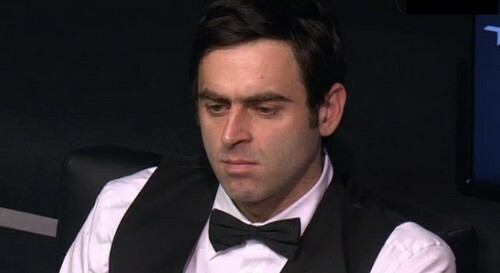 With Judd leading 4-0 at the mid session interval inside 45minutes the onus was on Ronnie to respond as quickly as he could- if only to halt the juggernaut of momentum. To his credit Ronnie put together a 67 that accounted for the fifth frame and reduced his deficit to 4-1. While there was an absence of big breaks in frame six it certainly was not lacking in drama. With Judd in front 41-28 and only two reds left on the table Ronnie couldn't afford any mistakes if he was to avoid going 5-1 down. Sadly there were two from the Rocket, the first when he missed a risky red to centre only to leave Judd the other on the bottom cushion available. As Judd claimed the two reds with colours he was now 27 points in front with only the colours left. It came down to a battle on the green and was settled when Ronnie tried to double the green to the top corner pocket- and in doing so left it sitting over it. 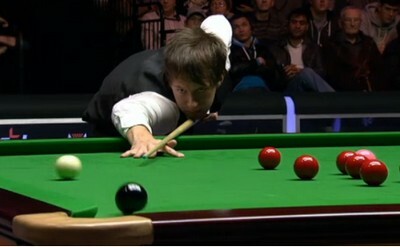 As Judd sank the green he was now 5-1 up and Ronnie needed everything if he was going to stay in the tournament. But Ronnie showed some of his mercurial brilliance as he drilled in the 622nd century of his professional career with a 141 to wrestle the top break prize from the grasp of Trump, and reduce his arrears to 2-5. Initially it aapeared it was going to be 3-5 as Trump's risky long red saw the cue ball career into the pack of reds, scattering them around the table. Taking the red to the centre Ronnie made 54 only to miss a red with the rest- and then lost a brief safety duel as the cue ball cannoned into the blue and left Trump with an easy starter. But with two reds on the side cushion a clearance on paper would be difficult. Watching it though was breathtaking as Judd cleared to the pink with 65 to win 6-2 and set up a semi final showdown with Neil Robertson or Mark Williams.